Too much of a good thing would be the best way to describe my participation as a judge for the #MacChallenge YVR. I think I'll refrain from any mac n' cheese for the foreseeable future (unless it's tasty... sorry, can't help myself). There was one pleasant by-product from the whole exercise though. On my final visit for some mac n' cheese, it brought me to Kessel & March. Since it was around dinner time and I had Sean, Adrian & Jeremy with me, we decided to have an actual meal (this was after trying 2 other mac n' cheese entries earlier). 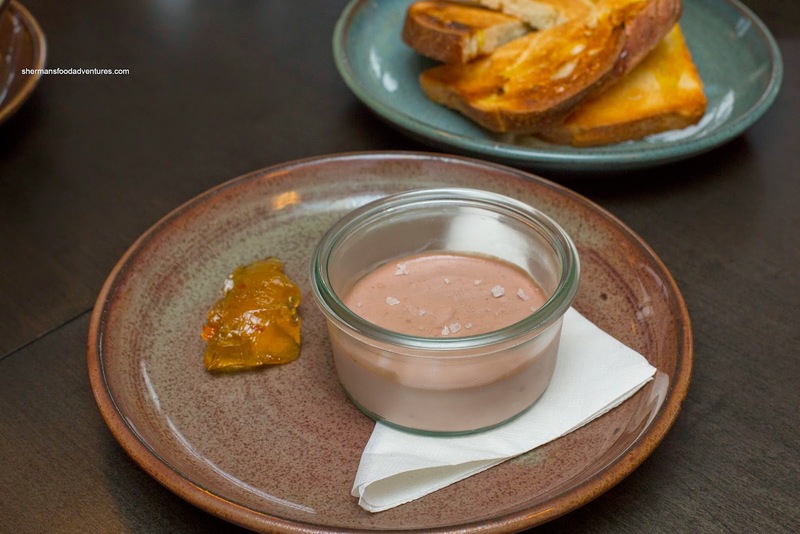 The first plate was the Chicken Liver Pate with orange marmalade and homemade toast. Smooth and creamy while purposefully sweet with hints of brandy, the pate was expertly prepared. As much as the pate was very good, believe it or not, the one thing that was the veritable icing on the cake was the wonderful toast. Crunchy and fresh, it was the ideal accompaniment. 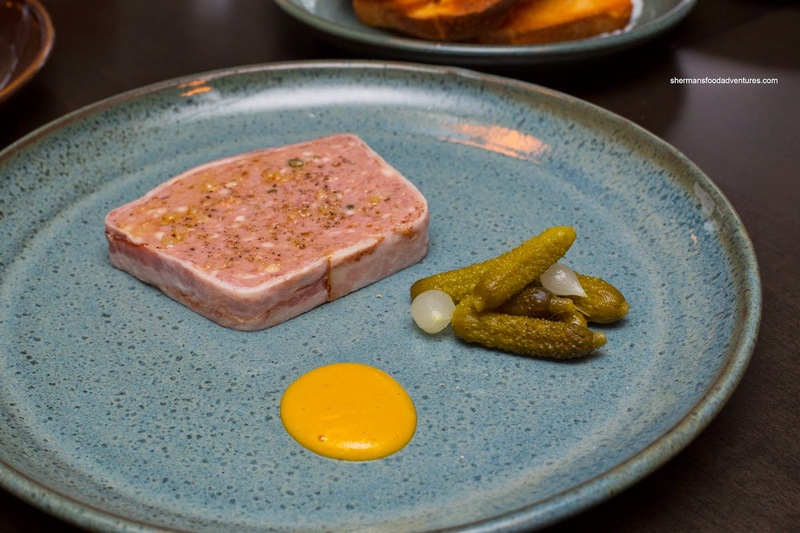 Next, we had the Farmhouse Terrine with mustard and gherkins. The pork terrine was meaty with just enough fat. It was mild tasting where it could've used a bit more salt. However, the sweet onions added the necessary counterbalance to the peppery notes. The dollop of mustard was more than for show as it was spicy and impactful. 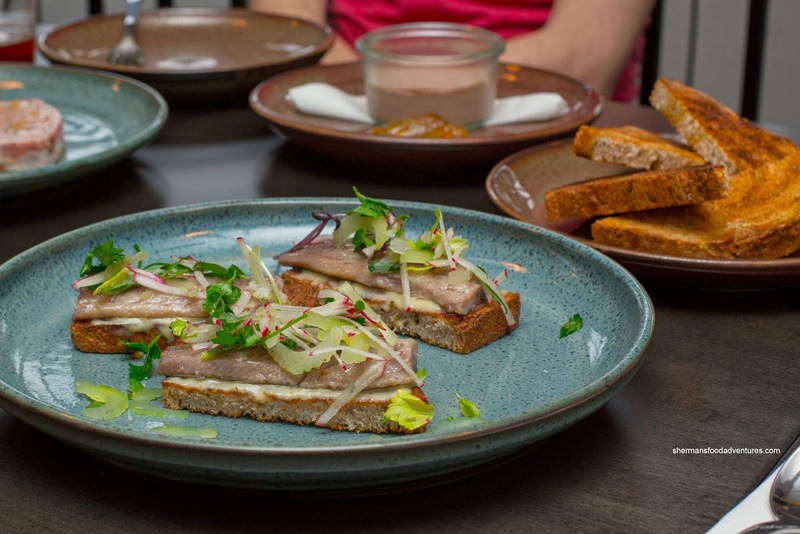 We then had a dish I originally sampled during the East Village Tasting Plates - Sardines on Toast. Seemingly a simple dish, it would prove to be my favourite and it was no different this time around. With thick filets of sardine, salad cream, celery and radish on crunchy homemade toast, there were big flavours and textures at play. The fish oils along with a balanced amount of sweet and saltiness, it was a party in my mouth. With even more toast (we didn't mind), we had the Mussels with fennel, chorizo and tomato in a white wine sauce. 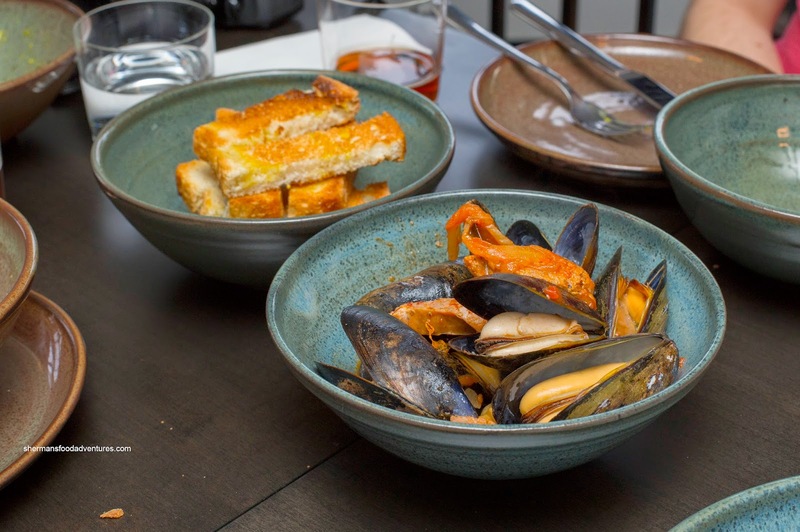 The large buttery honey mussels were bathed in a sweet and spicy broth. The wine had been cooked down nicely where there was some bite from the tomatoes. 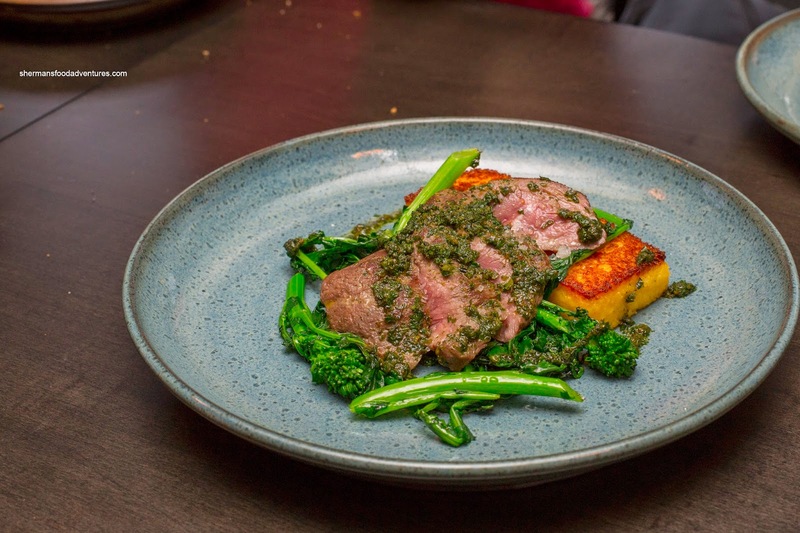 For me, I had to order the Lamb Sirloin with crispy polenta and rapini. The meat itself was a beautiful medium rare (closer to rare, which I personally prefer) where it was meaty with a slight chew. The green "sauce" on top was a good balance of herbs, acidity and salt. 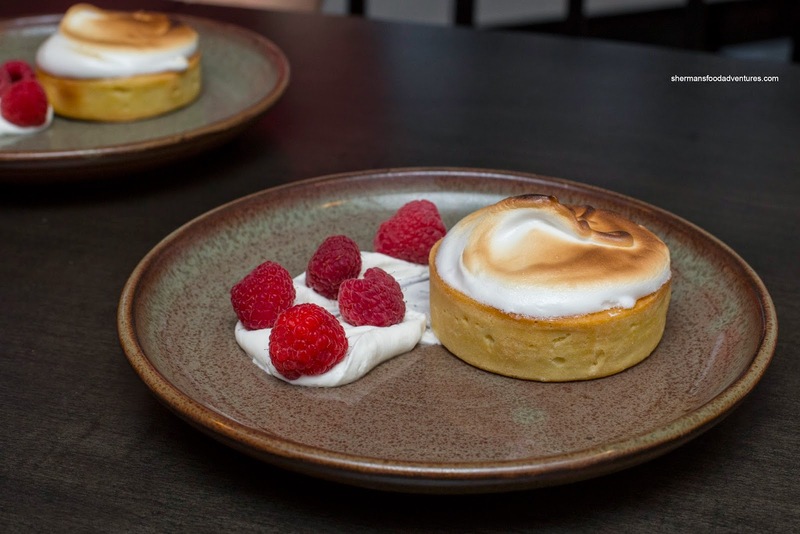 It added a brightness which livened up the dish. The crispy slab of polenta was more than bystander where it was a study in contrasting textures. It was not too soft either where it still had a bit of firmness. Lastly, we shared some Lemon Tarts. Unlike many other versions I've had, this one featured a crumbly tart shell. The lemon curd was more tart than sweet (which is my personal preference). It was really creamy and an overall nice dessert. This was ultimately an enjoyable meal that left me thinking about my next visit. 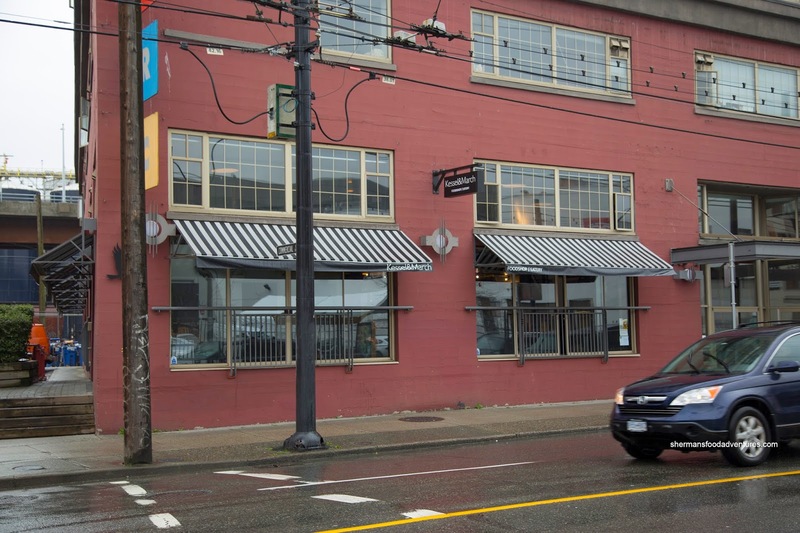 With a simple, focused menu, Kessel & March succeeds in offering up carefully prepared eats at a reasonable price.